STOP RIGHT THERE!, says your little angel on your shoulder – and you should listen to him. This situation happens multiple times a day to many different people around the world. You aren’t alone. With the great expanses of the internet, information, and the ability to know what is happening even before it seems to happen is exciting… and dangerous. You can call them ‘hackers’, ‘cyber bullies’, ‘con artists’, or what ever may fit for the situation. In the end, though, there is only one word for these people – thieves. They are here to fool you and get into your home virtually. They only want one thing – your money! And, you don’t have to give it to them. Be smart, be aware, use common-sense. Don’t open that attachment. Ignore that message. Don’t attempt to ‘do the right thing’ and clear your name. Ignore it – ignore it now, ignore it forever. Still have questions? Fine, look up the company in question, in this case, ‘Fed Ex’, and call them directly from a number on their website. Don’t go looking for information through the email that you received. It’s a white rabbit looking to lure you down a rabbit hole of fantasy and half-reality. Don’t go down the hole, for then, you are in their world. They can and will show you and tell you things that they want you to know and see. All for one final purpose, to get your money. It appalls me that, especially in this day and age of technology, that these people are still allowed, and able, to continue to do one of the oldest professions available, scam you. They may send millions of these letters, and 99.9% of them are probably ignored. But, for them to succeed, they only need ONE. One person to fall into their con game, and they made money. Just ONE. Does that not blow your mind? And, that person could have diminished mental capabilities, or it could be one of the smartest people on the planet having an off day, distracted by something else on their mind. It doesn’t matter, just the one. You are the one, Neo – take the blue pill and run. Why all the theatrics? I’m here to pull you in to my story, just like they are there to pull you into their cause. My cause is different, though. I am here to tell you, as a friend, a professional, and an expert, not to listen to them. If you get some laughs along the way, then, well, so be it! In all seriousness, though, yes, this happens all the time to so many people. Don’t feel you are alone. If it has happened to you in the past, don’t beat yourself up – just learn from the mistake and move on. Don’t feel pressured or fearful, and don’t feel you need to do anything. Your power is in your ability to stand strong. They are hoping that you aren’t that powerful. Don’t give in to their game. I know, it looks official, it feels as though there’s something wrong, but it’s nothing. But, perhaps you are saying, how could ANYONE fall for this kind of thing? Well, imagine this: You work at a company with 10 people. This email gets sent out randomly to multiple people multiple times over several months. One day, the boss is on vacation, and perhaps a new person was just hired as a secretary. This person receives this email, and thinks, “Oh boy, I need to get on this now!”. They open the email, the attachment, and, “BOOM!”. That’s all it takes, just one good situation like that, and then before you know it your entire company is infected with a virus that is demanding $500 per computer, or you lose it all. You’ve seen it on the news before, and you will again. There’s not much that can be done at this point. Have daily server backups for your company? Great! Computer backups too? Wonderful. It might only cost you a day’s worth of work to purge the systems and get back in business, only spending several thousand for techs and losing just as much in income and productivity. And, that’s the best case scenario. Worst case, you pay, and pay, and pay these thieves to get your livelihood back and to meager on with life and pretend it didn’t happen to you, all while attempting to educate your staff so it never happens again. In any case, you lose. In any case, they win. Even if they didn’t get paid, they have the satisfaction they ruined your day. Think before you open a strange email. Take it slow, and, ask someone if you are unsure. Don’t be alone in this. First things first. 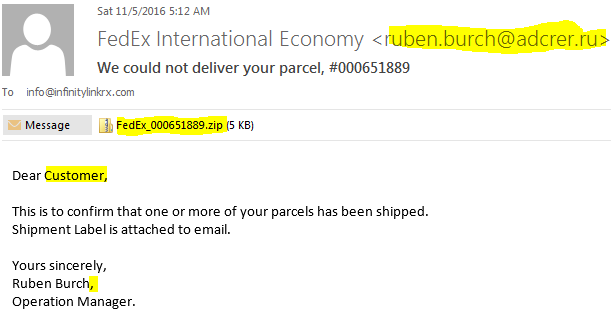 Look at the email address that this email originated from – ‘ruben.burch@adcrer.ru’ This is your first red flag. Why would a FedEx notification be coming from a non-fedex domain (not FedEx.com)? In fact, why is it coming from a Russian Federation (.ru extension of the domain)? Absolutely bogus. But, it says ‘FedEx Internation Economy’ as the sender! Yes it does, but that’s like sending a letter and putting your return address as your home, with the individual as ‘President of the United States’. You can put down anything you want, but it doesn’t make it true. Next, ‘Dear Customer’. Hmm, yes? I am a customer, but, what is my name? What do you mean you don’t know? This letter would obviously be put together by an automated system at FedEx, and by good design, my actual name and company should be addressed, but it is not. Why? Because the scammer doesn’t have this information. Strike 2. Strike 3 usually comes down to grammar and context. Many scam emails won’t even be spelled or punctuated correctly. Sometimes, its because they don’t care. Sometimes it is because the scammer’s first language is NOT English. See the comma after the closing name, and the period after the title? Both are bad form, and no professional would send an email out like this. In fact, they would also include their contact information, such as phone number, extension, and email. Though, scammers could include that info as a cover, expecting you not to call or email. Finally, look at the context – subject ‘we could not deliver your parcel’. 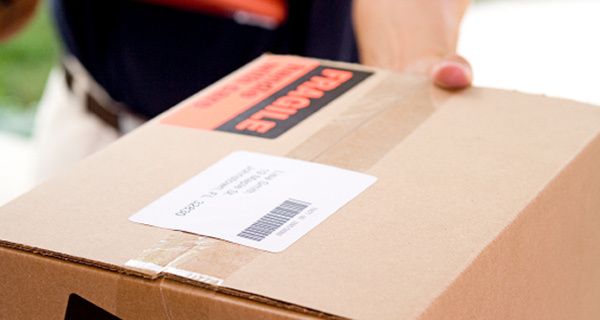 Message Body – We shipped your message, we attached your shipping label. What? Makes no sense. The two don’t connect up in any meaningful way – completely bogus. And that attached label? What is that about? Shouldn’t it be ON the package? What need do you have for it here? None. It’s just an excuse to get you to look inside that pretty little .zip present and find the hidden surprise. Now, this is one sad scam attempt. Some are more professional and are better put together, especially if they are targeting larger companies. But, for individuals and small companies like ours, sometimes, they just don’t try as hard. Again, they only need ONE to win. That’s not a fair game at all. Now that we had this talk, get out there, hold your head high, and know that you are one step ahead of those nasty thieves. Take your new-found knowledge and share with your friends and family. “Share the wealth”, and keep it away from the rabbit hole.